* NEW RESIDENTIAL CUSTOMERS ONLY. $35 ACTIVATION, EARLY TERMINATION FEE ($15/MO) FOR EACH MONTH REMAINING ON AGMT, EQUIPMENT NON-RETURN & ADD’L FEES APPLY. Price is after $5/mo. autopay discount for 12 mos. Pay $65/mo. + taxes until discount starts. Discount is instant for online orders on att.com only. In other channels AutoPay is req’d and discount starts w/in 3 bills. I. Restr’s apply. Searching for better entertainment options? Buy U300 from U-verse® TV. More than 470 channels are offered in this amazing TV package. From sports to movies to premium shows, get the entertainment you desire from the U-verse® TV U300 package. With U-300 you can get all the family shows, news coverage, and entertainment networks, plus a great deal of the best movie channels available on TV. You can watch the latest Hollywood blockbuster from your living room or your backyard using your free Wireless Receiver. The Wireless Receiver, which comes with free U-300, gives you the ability to break free from TV jacks so you can watch movies virtually wherever you have a TV. The best sports movies are based on true stories, and U-verse® TV allows you to experience those historic moments as they take place. With tons of sports to pick from, you’ll always have a reason to cheer. 6 billion people prefer Bollywood to its California counterpart. Find out why, and learn more about what the rest of the world is watching without leaving home. With the U-verse® TV International package, you can sample the world’s most popular movies right from your living room. U-verse® TV enables you to watch On Demand movies wherever with your Wi-Fi enabled device. Organize your queue and schedule recordings with the U-verse® TV application, and you’ll never miss out on your favorite movies again. Requires qualifying device and data connection. Content may vary based on your device, TV package and region. Data charges may apply. The second biggest U-verse® TV package has everything in the U200 package, plus a whole lot more. Get the entertainment you’re after, with the U-Verse® TV U300 package. With a great deal of channels to enjoy, you’ll need a way to optimize your viewing time. That’s where the Total Home DVR® from U-Verse® TV comes in handy.1 The Total Home DVR® provides maximum convenience, more storage space and standard DVR qualities. Start watching a show in one room and finish it in another. Record and store more standard definition and high-definition programming with this DVR. Pause, rewind and fast-forward recorded shows as well as pause and rewind live TV. Every DVR function you could want, in a simple easy-to-use format. Total Home DVR function is available on up to 8 TVs, and req’s a receiver for each TV at $9/mo. 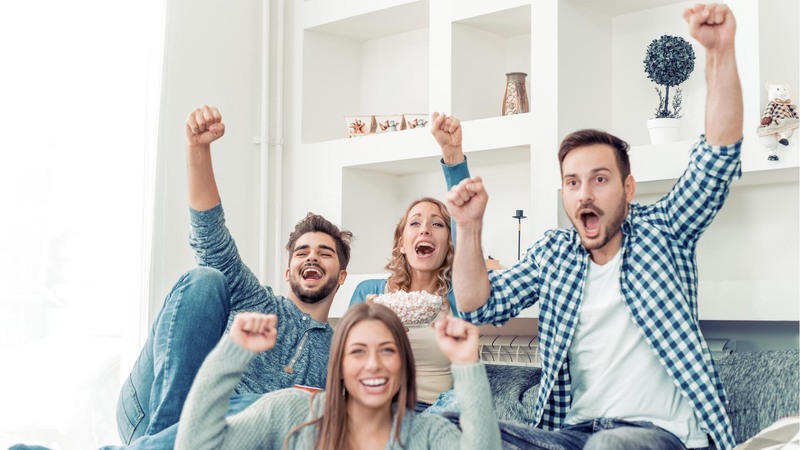 If you like to bundle up your TV and internet services, then U-verse® TV U-300 has the best double play and triple play offers for your best source of entertainment and connectivity. With so many awesome viewing and entertainment options, HD programming is a must-have. U-verse® TV offers many amazing HD channels! Watch every car chase, winning goal and fine detail in crystal-clear HD programming. Favorites like Disney Channel, Food Network, ESPN, Bravo, CNN and many more are all offered in HD. High-definition programming isn’t included with the U300 package, but can easily be included. Just consult the AT&T expert about HD when ordering. Get the channels you need in the quality you want with U-verse® TV. Stop looking around the Internet trying to search for a TV package with everything you want. The U300 package from U-Verse® TV is all you need for home entertainment like never before. Call now to get U300 from U-verse® TV or checkout the channel guide. Real entertainment is waiting.